In spite of great efforts done by the Government of India to tackle the problem of malnutrition, proportion of population normal on nutrition scale has been stationary; nearly half of them have been a victim of under- and over-nutrition. Over a period, undernutrition has declined but this has been compensated by overnutrition. Hidden hunger is a still an unfinished agendum. The achievement of food grain security at the national level did not percolate down, and households' food insecurity and level of chronic food insecurity are still high. High economic growth rates have failed to improve food security in India. There is a need and scope for organizational, financial, and managerial reforms in this direction. The repercussion of malnutrition is not limited to physical deterioration, but it also affects the psychological level of victims. The legislative, service, and educational approaches should be optimized to fulfill the dream of malnutrition-free India. Multisectoral approach (MSA) refers to deliberate collaboration among various stakeholder groups (e.g., government, civil society, and private sector) and sectors (e.g., health, environment, and economy) to jointly achieve a policy outcome. By engaging multiple sectors, partners can leverage knowledge, expertise, reach, and resources, benefiting from their combined and varied strengths as they work toward the shared goal of producing better health outcomes. Improving public health (PH) is challenging because of the size of its population and wide variation in geography. MSA help in addressing identified health issues in focused way as it helps in pooling the resources and formulating the common objectives. One of the major advantages is optimization of usage of resources by avoiding duplication of inputs and activities which tremendously improve program effectiveness and efficiency. Willingness at the leadership and mandate at the policy level are necessary to plan and execute the successful multisectoral coordination. All the major stakeholders require to share the common vision and perspective. Developing institutional mechanism is utmost requirement as it will standardize the processes of intersectoral coordination (ISC). Creation of PH cadre is strategic move to meet the major health challenges being faced by the health system, and it would be anchor of establishing systematic ISC. There are many national and international examples of MSA applications such as for malaria elimination, tobacco control, HIV/AIDS prevention, Finland's community-based cardiovascular disease prevention project (North Karelia Project), and Singapore's Health Promotion Board. Promotion of MSA within the health system and with other ministries is seen as an important measure for effective implementation and improving efficiency. Background: The discourse of mental health is getting its due attention after all these years in India. 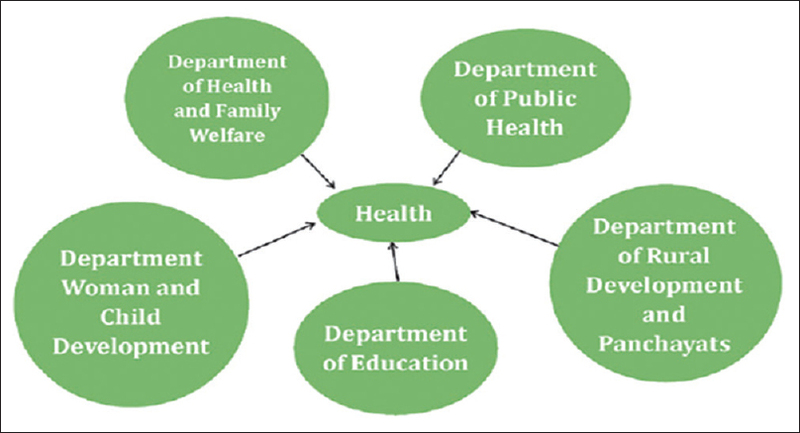 A major threat to the mental health system is the demand side factors, namely, knowledge, attitude, and practice (KAP) of the general population toward this. In spite of growing concern regarding mental health in India, this kind of study to assess the mental health status has been very few in India, more so in West Bengal. Objectives: With this background, this study was carried out with the objectives to validate the Community Attitude to Mental Illness (CAMI), to assess the different sociodemographic factors among the study population, to assess the KAP regarding mental illness among the study population. Methods: It was an observational, descriptive study with cross-sectional design done at Amdanga Community Development Block, North 24 Parganas, West Bengal, India, in 2015-16. Questionnaire validation to assess the KAP was the primary objective with obtaining the descriptive data were the second one. 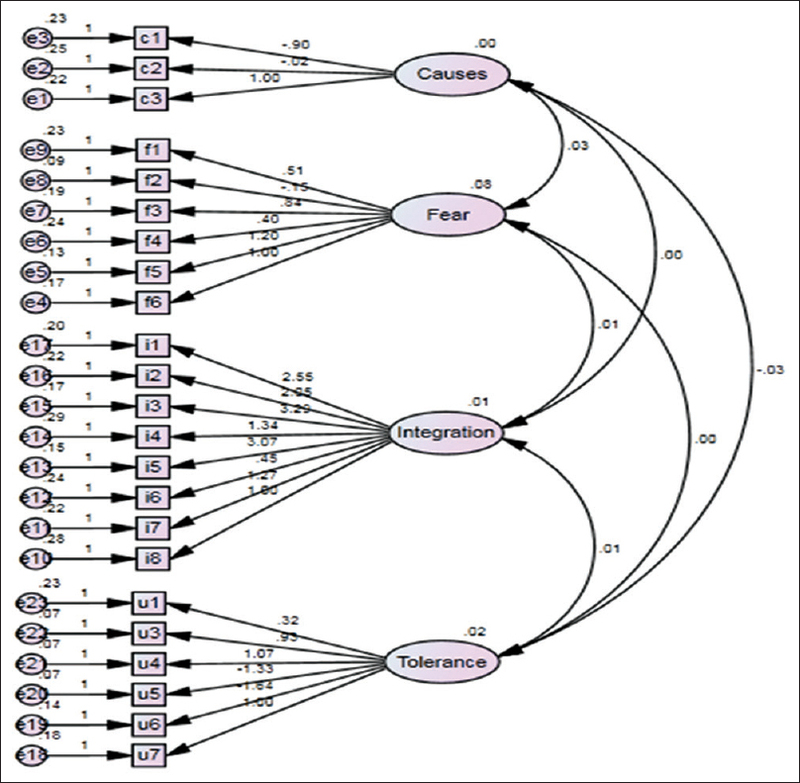 CAMI questionnaire was used which was validated for the given area by validation methods such as Cronbach's alpha and structural equation modeling. The resultant questionnaire was used in the field on adult population after a single-stage survey design to collect 730 samples. 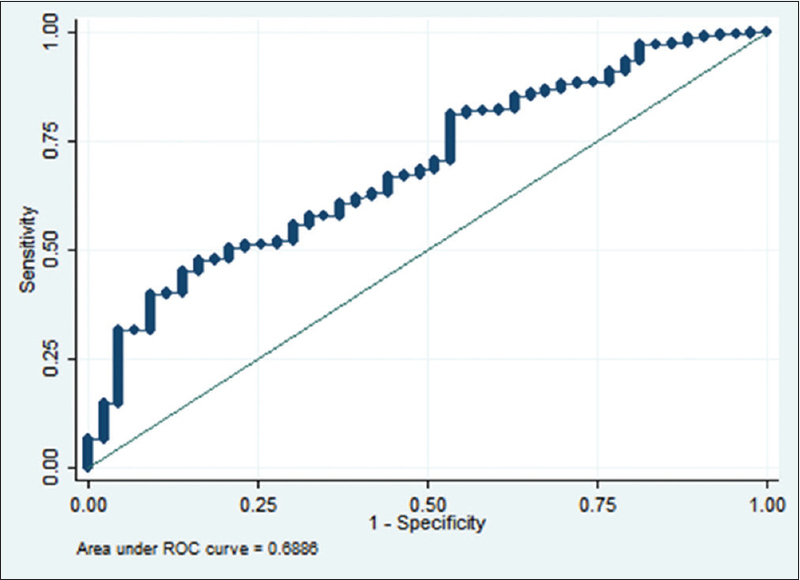 Results: The test statistics showed that the questionnaire was reasonably valid after a few tweakings. SEM identified well-define domains in the attitude part. 94.9% says that they are willing to live with a people with mental illness. 14.9% has actually done so. Health-care seeking behavior shows that 19.2% will go to a GP in case of any mental illness. Furthermore, attitude toward mental illness showed mixed picture as also knowledge. This study correlated with various studies of developing countries and it was seen that these population showed markedly different attitudes for probability of the patients getting cured than many other countries. Furthermore, stigma was gradually decreasing, as evident from various other studies. Conclusion: This study will provide valuable insights into the cognitive and affective aspect of mental illness among these population and thus help in implementing better policies in this regard, as this is fast becoming the talk of the day. Background: The global resurgence of rickettsial diseases and their potential to impact the fitness of military personnel and inflict widespread casualties amongst civil populations has emerged as a major cause of public health concern. Absence of surveillance system, lack of awareness amongst medical fraternity to rickettsial activity along with the difficulty in diagnosis because of their protean clinical manifestations are reasons for the outbreaks of these diseases. Objectives: To determine rickettsial activity amongst rodents and study vector diversity, abundance and their distribution to enable mapping of rickettsial hotspots. Methods: Zoonotic surveillance was undertaken in six selected study areas in India - Jammu, Akhnoor, Rajouri-Poonch, Udhampur-Nagrota, Dehradun and Pune. Weil–Felix test was used for rickettsial sero-surveillance amongst rodents and standard identification keys were used for mapping vector diversity and database preparation. Results: Serological findings revealed positivity to all the three rickettsial antigens (OXK, OX19 and OX2) in Jammu, OX19 in Dehradun and OXK and OX2 positivity in Udhampur-Nagrota belt. The vector database records presence of 16 species of trombiculid mites from three important genera - Leptotrombidium, Schoengastiella and Gahrliepia with ticks from five genera and 8 species of fleas from four genera. Mite fauna of study sites has been enriched with addition of new records of mite species (five mite species at Pune, two at Akhnoor with one mite species each at Jammu and Dehradun). Conclusion: The study reveals rickettsial activity amongst rodents at Jammu, Dehradun and Udhampur-Nagrota belt. The results correlate well with the presence of vectors of scrub and tick typhus and corroborate the occurrence of outbreaks of these diseases in the respective areas. 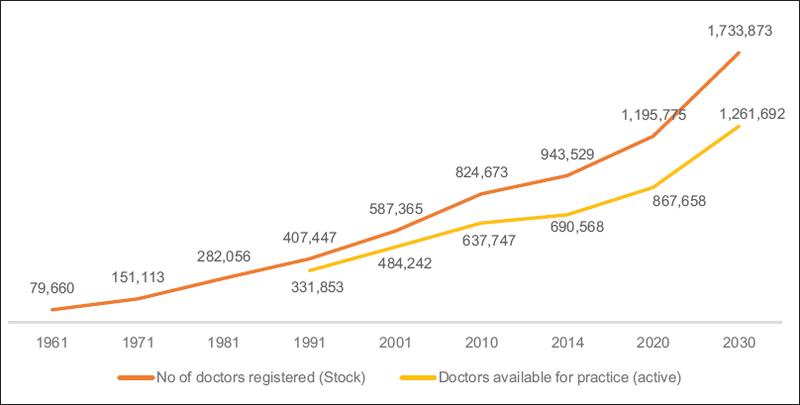 Background: The current belief of availability of doctors in India is based on the registration stock of doctors accumulated since the early 20th century. This has not been adjusted to attrition of the strength occurring due to retirement, emigration, etc. Objectives: To estimate the number of practicing doctors currently available in India and will be available in 2030 after adjustments made for attrition of the stock. 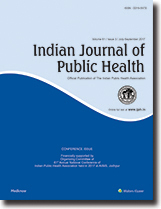 Methods: The paper used Medical Council of India's historical data (1960–2015) on registration stock of doctors obtained from the Indian medical registers available on its website and other data on emigration of doctors accessed from Organization for Economic Cooperation and Development and destination country sources. Results: The paper found that there were only 4.8 practicing doctors per 10,000 population available in India in 2014, in contrast to the belief of having 7 doctors per 10,000 people. Rest of the registered doctors have either retired or emigrated from the country to practice abroad. It is estimated that the country would be able to achieve a ratio of about 6.9 practicing doctors per 10,000 people only by 2030. Conclusion: Given these findings of the current availability of doctors per 10,000 people and their growth prospects over the next 15-year period, it looks like an impossible task to achieve even a moderate doctor-population ratio of 1:1000 by 2030. Therefore, a genuine commitment to provide equitable healthcare to the rural population must innovate and experiment a special cadre of practitioners for rural areas on a pan-India basis. Background: It is important to establish good dietary practices in childhood that promote adequate calcium intake throughout life and reduce the risk of osteoporotic fractures in later life. Objectives: To assess dietary patterns of 2–16-year-old children with special reference to calcium and suggest strategies and develop recipes suitable to identified patterns to increase dietary calcium intake. 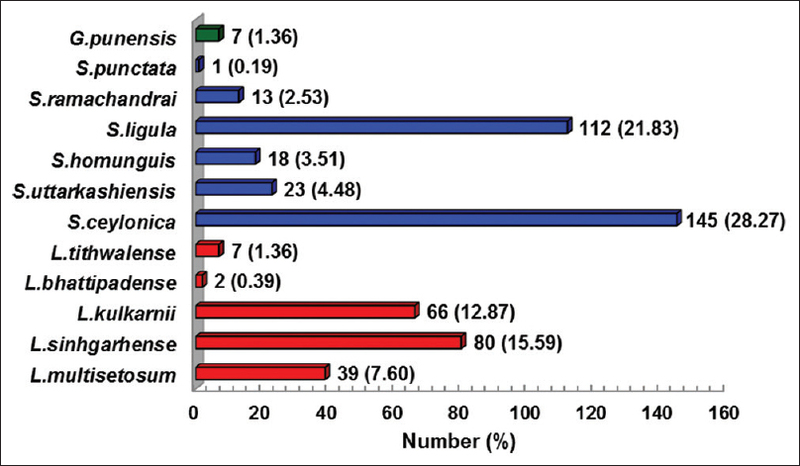 Methods: We studied 220 schoolchildren (2–16 years) around Pune city, India. The study duration was June 2013–July 2014. Height and weight were measured using standard protocols. Dietary intake was assessed by 24-h diet recall on 3 nonconsecutive days. Dietary patterns were derived by cluster analysis in two age groups; children (2–9 years) and adolescents (10–16 years). As per the dietary patterns, calcium-rich recipes were developed. Results: Among children, “rice-pulse” (RP) and “wheat, milk, and milk products” (WM) patterns were observed. 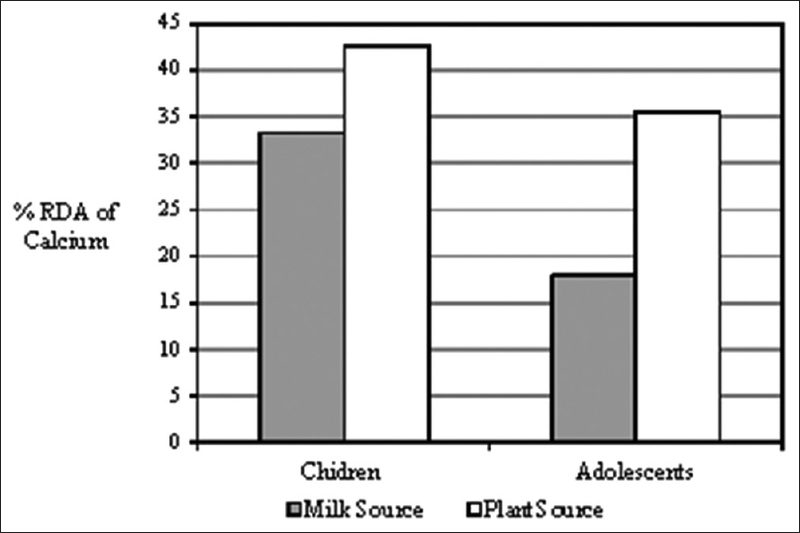 Among adolescents, RP, “wheat, milk, and bakery” (WMB), and “mixed food” patterns were observed. Children who consumed “WM” and “WMB” patterns had greater intake of calcium (P < 0.05) than children consuming other dietary patterns. The daily calcium intake of whole group was 53% of the recommended dietary allowance. From this, 30% calcium came from milk. Each serve of the developed recipe provided an average of 254 mg of calcium. Conclusion: Majority of children had cereal-pulse-based dietary patterns. By replacing foods from existing dietary patterns with calcium-rich foods, the dietary calcium content may be increased in a sustainable manner. Background: Vitamin D deficiency (VDD) is widespread, yet it is the most underdiagnosed and undertreated nutritional deficiency in the world. The prevalence of VDD is estimated to affect over 1 billion people worldwide. Objectives: The present study was conducted to estimate the prevalence of VDD among adult females aged 20–60 years residing in a rural community of North India, and to find its association with various sociobehavioral risk factors. Methods: The present study is an analytical cross-sectional study conducted among females aged 20–60 years in rural Ballabgarh. Four hundred women were randomly selected from one of the villages of the Health and Demographic Surveillance System. Semi-structured, pretested interview schedule was administered to the study participants. Fasting venous blood sample was collected for the measurement of plasma sugar level and Vitamin D (25-hydroxyvitamin D). Results: The prevalence of VDD was 90.8% (95% confidence interval [CI] – 87.5–93.3), while that of Vitamin D insufficiency was 8.9% (95% CI – 6.4–12.2). On logistic regression analysis, 24 h calorie intake, protein intake, and prediabetes status of the participants were significantly associated with VDD. Conclusion: Very high prevalence of VDD was observed among the females (20–60 years) residing in rural Ballabgarh. Background: Growing smartphone usage among global and Indian college students has resulted in considerable issues of “nomophobia” (NMP) or feelings of discomfort or anxiety experienced by individuals whenever unable to use their smartphones. This significantly impacts their health, work, and study. Objective: The objective of this study is to find out the prevalence of NMP among smartphone using medical and engineering undergraduates of West Bengal and to compare the nomophobic behaviors, its predictors, and smartphone usage among them. Methods: A cross-sectional study was conducted among 303 medical and 305 engineering undergraduates in West Bengal using a validated NMP questionnaire consisting of four factors. Comparison of means of individual questions and factor scores was done. Nomophobic clusters among the two groups were identified using two-stage cluster analysis. Binary logistic regression was used for comparison of predictors of NMP. Results: Engineering students showed a higher proportion of nomophobics (44.6%) than medical students (42.6%). Significant higher means was observed among engineering students for the factor “giving upconvenience” and individual variables like “scared due to running out of battery,” “nervous due to disconnection from online identity,” “uncomfortable when unable stay up-to-date with social media” and “anxious when unable to check E-mails.” A Higher proportion of nomophobics among both groups were females, those owning smartphone beyond 2 years, having monthly mobile bill above Rs. 200 and spending over 4 h daily on smartphone. Conclusion: NMP has emerged as a significant cause of concern among both the groups. Standardized measures for identification and appropriate psychobehavioral therapy for those seeking help might alleviate the problem. Globally, alcohol has become the most common risk factor for death and disability in the young age group of 15–49 years. Its use has been rapidly increasing in developing countries. It is a critical time wherein if effective preventive measures are not undertaken urgently, damage done will be difficult to reverse. However, health professionals are not responding to the alcohol epidemic in the manner that they responded to the tobacco epidemic. The article discusses two beliefs which are making us accept the use of alcohol as normal. Recent evidence indicates that it is not advisable to drink alcohol even in moderation. Furthermore, social drinking has failed to decrease alcohol-related harm in western countries. Because of its addictive nature, many people end up drinking excessively though they do not intend to. Hence, we need to shift our focus from only “reducing harmful use of alcohol” to “reducing use of alcohol” in general. Cardiometabolic health status of 356 women (age 25–65 years) from Tripuri tribal community of Tripura, a Northeastern state of India was evaluated. The height, weight, waist, hip circumference and blood pressure, blood sugar, total cholesterol, triglyceride; high-density lipoprotein cholesterol, low-density lipoprotein cholesterol, and very low-density lipoprotein cholesterol were recorded. Cardiometabolic risk was assessed according to the recent definition for Asian Indians. The overall prevalence of cardiometabolic risk was found to be 27.24%. Postmenopausal women showed a higher prevalence of risk than premenopausal women. Central obesity was the most prevalent risk component among all the subjects. The urban population with high income and higher education level with sedentary lifestyle were more prone to cardiometabolic risk. The study revealed that a substantial proportion of ethnic Tripuri women are having prevalence of different cardiometabolic risk factors. The fact needs to be taken into consideration while considering strategies to mitigate noncommunicable disease burden of the population. Parental perception of safe and risk-free environment is critical in the prevention of unintentional childhood injury. 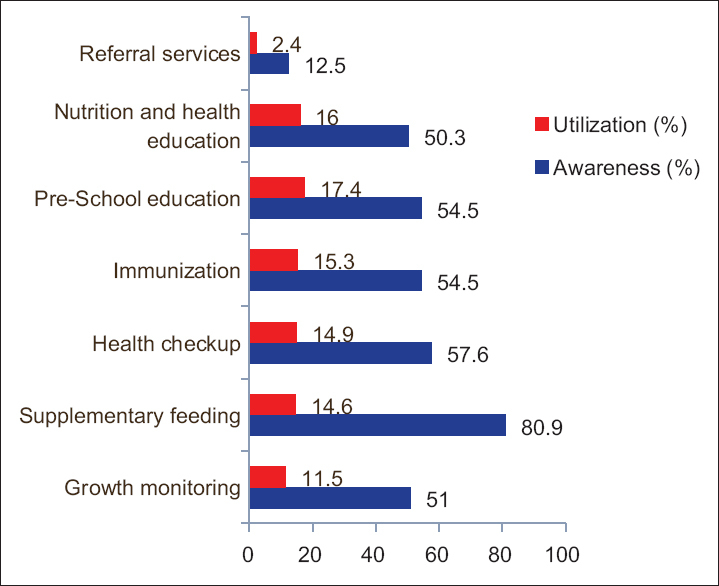 In this cross-sectional study, hundred mothers from 13 clusters were interviewed to assess the perception of mothers regarding the risks and hazards leading to unintentional childhood injuries from March to April 2013. A tool developed by Glik et al. was used. Mothers' perception of likelihood of injury from hazards such as household door and drawers, small toys, plastic bags, and cribs was poor. Mothers had a poor perception of injury by entrapment in refrigerators, choking, and strangulation by a rope. Age, education, and literacy (P < 0.05) were found to be significant predictors of perception of risk and hazard. Very few mothers (9%) believed injuries can be completely prevented and illiteracy (P < 0.05) was associated with poor perception on prevention. Health education should focus on improving maternal perception which may bring positive impact on prevention.